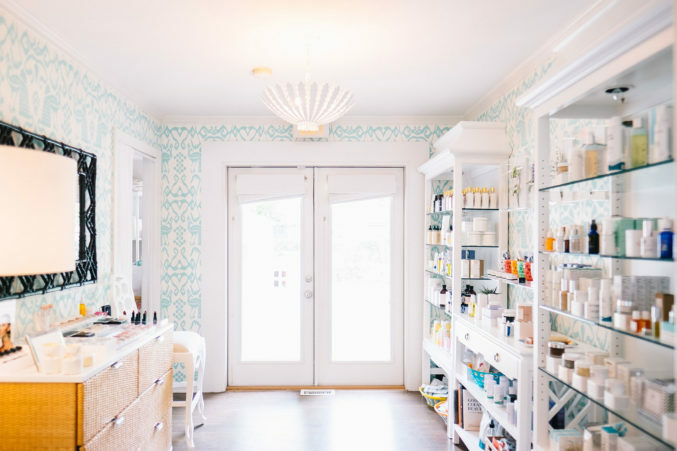 The Greenway Shop founders Flauren Bender and Hallie Lamont are here to help you get rid of puffiness and under-eye bags. From the kitchen to cosmetics, everything old is being made new again. As caveman diets become the new craze, there has been a simultaneous rise in clean beauty products. 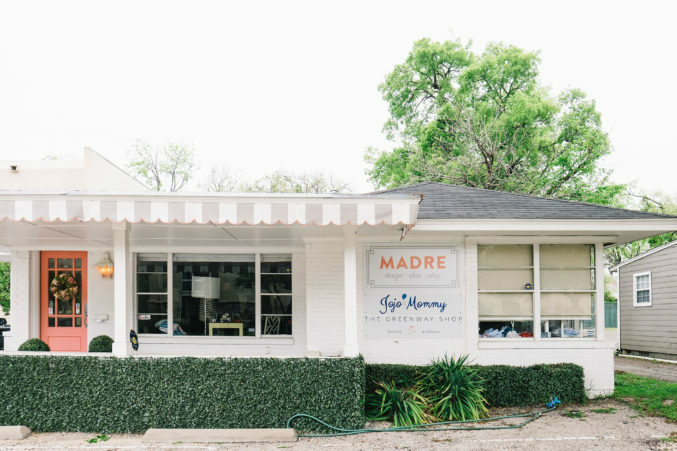 The Greenway Shop, a haven for all things natural beauty tucked inside Madre on West Lovers Lane, is providing Dallasites with an oldie-but-goodie: jade rollers. Originating in China during the seventh century, jade rollers are hand-held massage tools intended for your face, and—as the name hints—they’re made from the smooth green stone. With the proper technique, jade rolling can improve facial circulation and reduce swelling. So the next time you indulge in some salty Tex-Mex, refer to Greenway Shop owners Flauren Bender and Lamont’s combined wisdom on the ancient subject. Can you give us a brief intro to jade rolling? It’s a tool that has been around for centuries in Chinese medicine, as it’s believed to draw out negative energy. Jade is also naturally a cooling stone and smooth surfaced, which are ideal properties for the delicate texture of the face. Along with eliminating puffiness, other benefits might include improving skin elasticity, preventing wrinkles, boosting circulation to the face, tightening pores, and assisting in the infusion of serums and oils into the skin. Is there a specific technique to jade rolling? Yes, we like to follow the “workout” as recommended by our exclusive vendor, Skin Gym. Step 1: Apply your favorite serum, oil, moisturizer or mask. Step 2: Starting on the chin, work from the center outward and upward toward the cheeks. Then back at the center of the chin, make sweeping rolls under the chin towards the collarbone, working outwards toward the sides of the neck. Step 3: Roll the crystal facial roller starting from the center of your neck, rolling upwards and outwards. Continue this motion on each section of your face. Where does jade rolling fall in a skincare routine? We recommend jade rolling post-face wash and after you have applied your serum or moisturizer of choice. Rolling helps to infuse the product into your skin. Our favorite facial moisturizers for jade rolling are Pai Skincare’s Rosehip Oil and Indie Lee’s Squalane Oil—both lightweight and great for all skin types. On the same note, should you apply anything to your jade roller before using it? It’s helpful to lubricate the connector on both ends with vegetable oil for long-term care and smooth rolling, but it’s not required. Can you only use a jade roller on your facial region, or are there other ways to utilize the tool? Don’t forget your jawline, neck and décolletage! I would not use this tool anywhere else though, as it’s designed to impart just the right amount of pressure upon the delicate skin of the face and neck. We like to think of a jade roller as a foam roller for your face. If you crave the feel of the facial massage a jade roller provides, then try a foam roller on the rest of your body. We love Lauren Roxburgh’s foam rolling detox workouts. Is there a specific temperature to keep your jade roller in that will make it most effective? Room temperature is fine, as jade is naturally cooling. You can always pop it in the freezer for a minute or two to cool it down for an added lymphatic drainage boost. Is there a technical way to clean a jade roller to make sure it’s always fresh and effective? Gently wiping it off with a dry washcloth after each use and storing it in a clean, dry place is best for the delicate parts of the roller, which can rust if exposed to dampness. If you want to deep clean your roller you can remove the heads and deep clean the crystal parts with water and gentle soap. How did you get into jade rolling? I was first introduced to jade rolling by my facialist Wendi Hardage of Misaotra Sanctuary. She uses jade rolling and Gua Sha techniques in all of her facials, which are dreamy. She always uses natural and organic products as well. How have you seen the benefits in your life? I have for sure seen the short-term benefits — jade rolling always helps decrease puffiness and leaves a pretty rosy glow on my face. Long term is still TBD… but who doesn’t want a nice cooling facial massage and decreased puffiness?